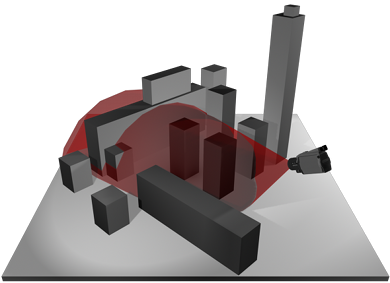 There are many scenarios in the real and virtual world where it is desired to maximize sensor visibility of groups of targets. For example, in video games, it may be desired for a third-person view camera to track and follow a group of characters through complicated virtual environments. In robotics, a camera attached to robotic manipulators could also be controlled to observe live performers in a concert, monitor other robots as they perform a task such as assembling a mechanical system, or maintain task visibility automatically during teleoperated surgical procedures. The following videos show the difference between the reactive camera (left) and the camera that plans its motion (right). The reactive camera quickly loses its visibility of the moving group after the group starts to move. Using the ideas of monotonic tracking regions and ghost targets, we can address the difficulties of maintaining visibility of coherent groups of targets (such as flocks or crowds) that may bend around obstacles and split into multiple groups, and show the ability to track large groups (with tens to hundreds) of targets at interactive speeds. This video shows a simple example of our following algorithm (MTR Camera) tracking and following a group of agents through an obstacle filled environment. The camera can maintain high visibility of the flocking agents despite the flock splitting and merging, going around corners, and entering narrow passages. The following videos again show the difference between the reactive camera (left) and the camera that plans its motion (right). 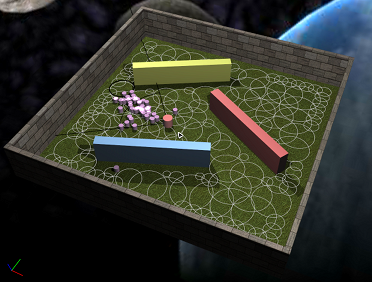 In this example, both cameras are following the points sampled from a rigid body (a dog in this case). The reactive camera have much higher chance of colliding with the dog while the camera with proposed motion strategy is able to maintain the visibility while avoid collision. 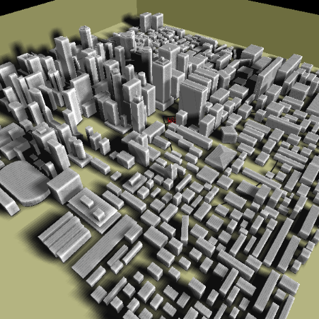 This video shows the camera with proposed motion strategy following a group of agents in a city-scale environment with 161 buildings (as shown in the image on the right).